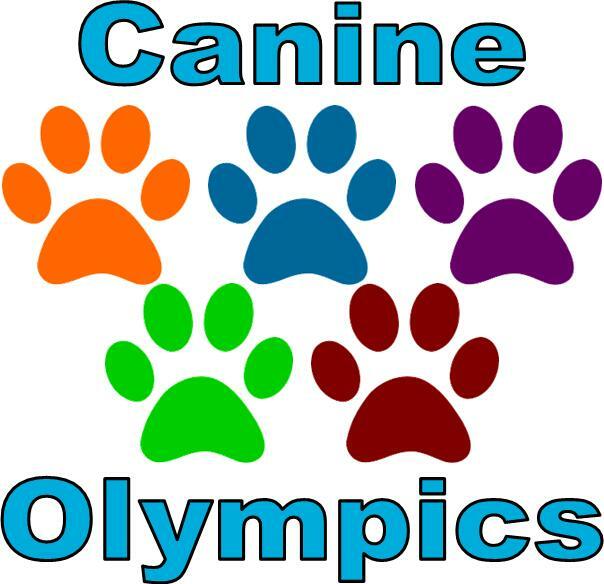 Catch Olympic Fever with your canine pal and compete for great prizes and bragging rights in a series of skill testing challenges hosted by Quinte Canine. These fun events will put both you and your dog through your paces while keep the audience howling! Handlers are given 30 seconds to gain as many possible tail wags from their dog. Tail wag is considered for each full completion of a wag (returning to original position). The dog with the most tail wags at the end of the 30 seconds will be deemed the winner. In the event of a tie the teams with the tied number of wags will then be given an additional 30 seconds to break the tie. For dog with no obvious tail (unable to see complete tail movement), rear end (bum) wiggles can be counted as wags. A start and a finish line will be marked within the race area; the two lines will be approximately 40 feet apart. Handlers will have the option to place their dog into a stay position at the start line or may use a secondary handler to hold their dog in place. The handler will then proceed to the finish line and have up to 10 seconds, once she/he has crossed the finish line to call their dog. The timer will begin the moment the dog crosses the start line and the timer will finish the moment the dog crosses the finish line. In the even a dog is released prematurely or leaves his/her stay position that dog will have been considered to have started the race the moment he/she crosses the finish line. There will be distractions along the race path such as stuffed toys. The dog with the fastest time, start line to finish line, will be deemed the winner. In the event of a tie the teams with the tied time will then be raced again to break the tie. 2 minutes to have some fun and/or gain confidence! A variety of obstacles will be placed within the area. The order in which the teams choose to complete the obstacles is the decision of the handler. All teams are given a maximum of 2 minutes to complete the course or just have some fun bonding and building confidence. This is a great opportunity for your dog to have some fun. New things such as dog walks and tunnels can be a little scary for some dogs at first so we will help you to teach your dog that it can be fun! Obstacles can include a bar jump, tunnel, crawl, cavaletti, crawling, etc. (Jump heights will be set according to the dog height – for dogs with different abilities or senior dogs, consideration will be given for jump heights and any modifications needed). Before beginning the limbo attempt, all dogs will be measured against a measuring wall to determine which category that dog will enter. Each dog will be placed into a height category based on the height of the dog at the withers (shoulders). Categories include 10” and less, 10”-16”, 16”-22”, 22+” and over. Each of the 4 height categories will have a winner! Once measured, the dog and handler will proceed to the limbo (dog bar jump). The handler will then encourage their dog to crawl under the bar without touching it. After each successful crawl under, the bar will be lowered and the team will repeat the process. The dog will be judged by the Limbo Coordinator who will determine if the dog touched the bar or not. Our best efforts will be made to ensure the limbo is accurate. In the event of a tie between dogs of the same height category, the teams will have the opportunity to continue attempts to crawl under at lowering heights until one final dog remains. We maintain the right to limit entries due to time restrictions. Interaction between handlers and dogs during the games is encouraged. Handlers may talk to their dogs and encourage them with verbal praise. Rewards (including food and toys) may be used only during some games. Handlers should ensure they do not drop any food onto the game area at anytime during the game. A dog that displays unruly behaviour such as growling, aggression, or lunging at people or other dogs at any time will be immediately disqualified from the games. Any handler who shouts, is deemed to be intimidating, physically corrects or mishandles a dog will be immediately disqualified from the games. All handlers may use a 5-6 foot nylon, cloth or leather leash and well fitted slip, buckle or martingale collar made of fabric or leather. Not chain leashes, retractable leashes, choke collars, etc will be allowed in the games area. We encourage and welcome handlers and dogs with disabilities to participate in the Canine Olympics. Persons needing accommodations to any game are encouraged to speak to the event coordinator so that all possible accommodations can be made. We maintain the right to limit entries due to time restrictions. Additional details and rules will apply to maintain a safe and fair day for everyone to enjoy.